November 1, 2012 - Hawker Beechcraft Corporation (HBC) executives joined Barrington Irving on Tuesday at the National Business Aviation Association’s annual convention in Orlando to launch Classroom in the Sky, an initiative of his 501(c)(3) non-profit organization, Experience Aviation. HBC will serve as title sponsor for Classroom in the Sky by providing a Hawker 400XPR for the duration of the around-the-world mission to transform an airplane into a science, technology, engineering and mathematics (STEM) teaching tool for youth. “Sponsoring Barrington’s Classroom in the Sky initiative is a natural fit for Hawker Beechcraft: we provide an aircraft that showcases its ability to meet his rigorous mission requirements anywhere in the world and we help highlight the importance of STEM education in creating a strong future for aviation and other industries,” said Shawn Vick, HBC’s executive vice president, Customers. Irving, who at the age of 23 became the youngest person and first black pilot to fly solo around the world, founded Experience Aviation in 2005 to build STEM skills in students and direct them toward careers in aviation and other STEM-related fields. 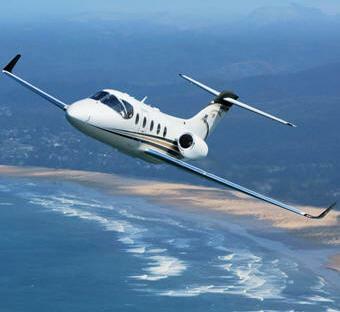 The 28-year-old plans to launch the Classroom in the Sky expedition in October 2013 at NBAA and circle the globe in the Hawker 400XPR. Born in Jamaica and raised in Miami’s inner city, Irving said a chance encounter at age 15 with a Jamaican-born professional pilot opened his eyes to careers beyond sports. The man invited Irving to tour the cockpit of an airliner, and that was all he needed to get hooked on aviation. Among Barrington’s many accolades is a 2007 Congressional Resolution acknowledging his historic achievement and his pioneering work in the field of aviation education. In addition, he was recently named National Geographic’s 2012 Emerging Explorer (see Barrington Irving To Set World Record).